There is ‘immense potential’ to use solar power to bring electricity to rural India, according to research from Ricardo Energy & Environment. Commissioned by the UK Foreign Commonwealth Office and working in close collaboration with India and UK industry partners and India’s Ministry of New and Renewable Energy, the research presents recommendations to develop supply chains to accelerate the take-up of photovoltaic (PV) mini grids. Although India’s electricity grid has expanded significantly over the past decade more than 33 percent of households still do not have access to grid electricity. As part of its commitment to bringing electricity to the entire country by 2022, India is undergoing a number of radical power sector reforms. Sustainability is an important part of this process, and PV mini grids present a powerful method of quickly bringing energy generation to rural areas. However, there is a need to develop international supply chains, national policy and financial structures to make renewable technology practical and financially viable. 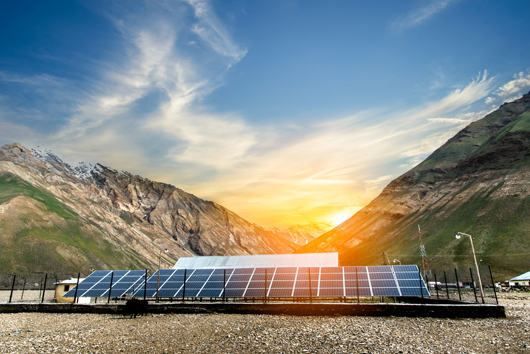 The research – which follows a year of close collaboration between Ricardo Energy & Environment’s technical specialists, government ministries and power sector stakeholders – recommends a series of immediate actions to scale up the Indian PV mini grid market. This includes supporting private sector and local supplier innovation, developing business models to ‘de-risk’ solar energy projects, and defining technical standards for mini grid design and installation. The close involvement of international supply chains for the development and manufacture of PV components is also highlighted as a critical component for success. Ricardo Energy & Environment has a strong working relationship with the Government of India and has supported a number of energy and environmental projects in the region. This includes sharing knowledge on energy market reform to support the development of an efficient, reliable and financially robust power sector.